So I was taking the trash out on Monday evening when I was approached by a cat. It was dark out, and it was a black cat. I didn’t realize what was happening until two people riding bicycles on the street called over to me: “He’s been following us around and we’re worried he’s going to follow us home. Would you distract him for a moment so we can get away?” And that’s when he trotted over to me. “Thanks!” said the bikers, and rode away. It was a small black cat. A kitten, really. Regular-cat-shaped, but not yet full sized; couldn’t have been older than a year. Bright amber eyes, more orange than yellow. It twined around my feet and rubbed up against my ankles. It made a squeaky little meow. I petted it; it pushed its head eagerly into my hand and purred. I walked down our neighbor’s driveway to get their trash can to push it to the street for them. All the way down, the kitten kept running in front of my feet and stopping as if to trip me, so I had to walk carefully in the darkness. As soon as I rolled the trash can the loud noise startled it and it ran behind the garage. Cute kitten, I figured, I hope it’s okay out here. When I came back inside Jill was putting the harness on Lily, our maltipoo (fluffy white, six pounds, not quite two years old). “Here, I’ll come out with you,” I told Jill. As Jill walked the puppy down our front walk, I saw the shadow of the black kitten dash along behind them. I pointed it out to her and told her the whole story so far. “Aww! Maybe it’s hungry!” she said, and put a bowl of dry food on the front porch. The kitten hungrily chowed down, squeaky-mewed at us a few more times, and rubbed up against whatever hand was presented to it. “That is not normal cat behavior,” Jill observed. “It really seems like it’s someone’s pet.” At that moment we happened to see August walking down the street – he runs the Paw Academy dog walking business and he walks Lily for us when we’re out. He said hi, the kitten pushed itself into his hands for attention, and August agreed that this kitten was far too friendly to have been feral. The kitten was thrilled to let me pick it up. It got tired of this within half a minute, but I scruffed it and that stopped the squirming. We put it on our back (screened-in) porch with some food and water and a litterbox and a towel to sleep on, and left the porch light on for it. As we were getting ready for bed we peeked out at the back porch. Kitty was neatly loafed in a secluded corner of the porch, and was comfortably watching the world outside. That was all on Monday, May 13th. On Tuesday morning Jill brought the kitten to the Celebration vet. 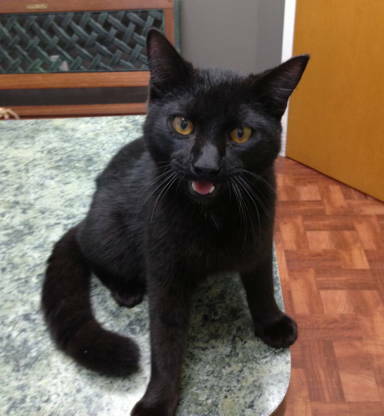 They verified that he is male, about seven months old, and is not chipped. I posted to the Celebration forums in case anyone’s looking for a lost kitten, and then that evening I spent some time on the back porch with him. He’s definitely friendly. Very friendly. Comes immediately over to me and to Jill, is interested, purrs, squeak-mews, rubs up against us. I sat down on the floor and he immediately flopped down beside me, then relocated between my shoes and leaned up against them. Loves being petted, especially the top of his head and his cheeks. Not as keen on being held or having his belly touched; whenever I did, he would gently pull my hand to his mouth and close his teeth over my fingers – not a reflex, not even really a bite, more like a warning. Coming back into the house was difficult because he again liked to walk in front of our feet, and we could see him very interested in the door as it opened, but we kept him on the porch. And there he stayed. On Friday morning Jill ran him up to our regular vet, the Bay Hill Cat Clinic, where they vaccinated him and chipped him and declared him disease-free. And this is a photo of him at the vet. Before Jill, I never had pets of my own. Today, in addition to Lily, we have Toulouse (nine-year-old Russian Blue) and the two of them play together; and we also have Fenris (eighteen-year-old Norwegian forest cat) who’s confined to the kitchen because she used to yak and pee on the carpets. We also had Blackie until we lost him to cancer two years ago – Blackie was shy but sweet, he was a doofus of a cat but I spent a lot of time with him and he had been gradually becoming more comfortable with me, and i still miss him dearly. So on Saturday Jill and I had a talk. “I could print up some adoption posters, put them up at the vet’s and at Woofgang Bakery,” she offered. We brought him inside, gave him a bath (he was unhappy but reasonably calm about it), and settled him into the upstairs bathroom for now. Later we heard Tooie yowling indignantly outside the bathroom door and we worried he would pop the door open and let the kitten out, so we locked it. We’ve both been spending time in there with the kitten. He’s adjusting just fine. He’s asserting himself a little bit more with me, looking for chances to pull my hand into his mouth; but when I finally got tired of that I scruffed him and pulled him into my arms and held him for a while, and he snuggled in and napped on me. Which brings us to the next challenge: Choosing a name for him. Would you help? Khan would be an awesome name for a black cat. It’s a timely Star Trek reference, it’s a Disney reference (Shere Khan as well as Mulan’s black horse Khan), and it’s short. But is this friendly kitten really a Khan? Since Jill and I play Guild Wars 2, I thought of Grenth (god of death) or Melandru (goddess of nature; there are black panthers named Melandru’s stalkers). I always liked the name Ozymandias and it can be shortened easily. Celtic folklore has Cait Sith which shows up often in popular culture (and has a Star Wars flavor). A Japanese name would be interesting, so I looked to anime. “Jiji” has been done before. Studio Ghibli’s The Cat Returns has Baron and Natori and Natoru, though none of them are black cats. Apparently there’s an anime named Darker than Black that has a black cat named Mao but I’ve never seen that series. I’m a fan of Space Cruiser Yamato and Captain Harlock and they have a kitty named Mi-kun, but it’s striped. That’s all I’ve got so far. Ideas? Meanwhile I’ll continue to see how the little one’s personality develops! A friend of mine has a black cat named Yeti because they didn’t want to have a traditional “black cat” kind of name. It doesn’t have to be related to black; cats don’t care. I love the idea of Ozymandias, as he was quite the character in the White Mountain series (one of my favorite SciFi book series of my youth). I’ve never heard of that series. What’s it about? Dystopian YA Sci Fi. It is set 100 years in the future, when all the world has reverted back to small little communes of people and they are controlled by ‘the tripods’, who ‘cap’ the citizens when they turn 13 (16 in the BBC series). The cap is a tool by which everyone is controlled. Ozymandias is a key character in the story’s beginning.